The tvi950 has to be one of the ugliest machines I've ever seen. It reeks of early-Eighties computing. It has a board date of 1982; other than that I know nothing of it other than what's available on the Internet (read: not much, and www.televideo.com is something completely different). Since there is a dearth of information available, let me recount the mildly amusing story of how I procured it. Early 1996: a Mac Plus at my high school gets a short on the analog board adjacent to the flyback coil. Magic smoke plumes. The computer is toast. Click here to view all comments for the TeleVideo 950 and to leave your own. 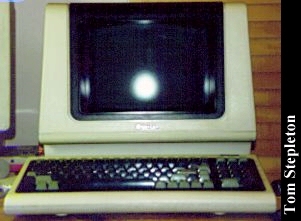 Click here to view comments about other TeleVideo computers.